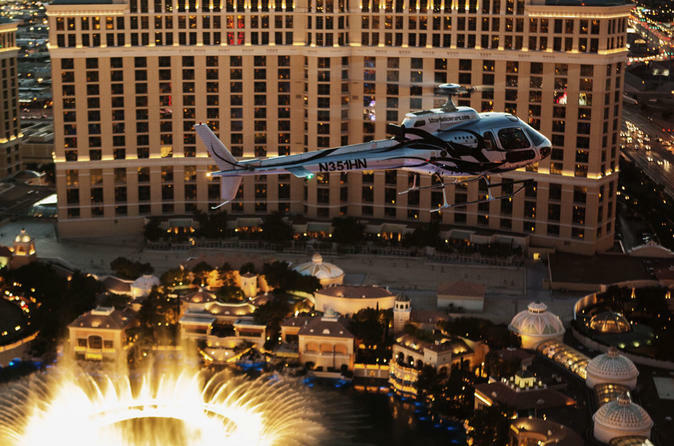 Take romance to the skies as as you celebrate your visit to Las Vegas with a helicopter flight combined with a fabulous dining experience at the world famous Eiffel Tower Restaurant. Enjoy guaranteed window seating for dinner as you have the best views of the Bellagio Fountain show. This VIP experience includes transportation by semi-private SUV from your hotel, to the heliport and onto dinner. Feel like a celebrity as your luxury SUV greets you and takes you to a private helicopter tour facility located north of the Las Vegas Strip. Enjoy a champagne toast in the VIP room before boarding a jet helicopter. Rise above the Las Vegas skyline, as you soar past the Stratosphere Tower and over fabulous Las Vegas landmark's including Caesar's Palace, Bellagio, City Center, Mandalay Bay, The Luxor, MGM Grand, the High Roller, Paris, Venetian and the Wynn Resort. After your amazing Las Vegas Strip helicopter tour, you will be whisked away to the 11th floor of the Eiffel Tower, as a sumptuous 3-course meal created by Chef Joho awaits you at the Eiffel Tower Restaurant (menu changes seasonally). Splendor the panoramic views of Las Vegas from your guaranteed window seat including the Bellagio Fountains, where the water jets dance over 200 feet high. After dinner, you are free to continue your night out in Las Vegas or make your own way back to your hotel. This is the ultimate night out in Las Vegas and an experience of a lifetime! Please note all menu items are subject to change and change seasonally. Drinks are available to purchase directly on the night and are not included in tour price. If you have any dietary restrictions, please advise at the time of booking so these can be accommodated as much as possible. The dress code for Eiffel Tower Restaurant will be enforced. Dress code is business attire; no T- shirts, shorts, athletic wear of any kind. We request gentleman to wear slacks, a collared shirt and no open toed shoes. Jackets are not required.